This is a super easy and delicious one-pot meal. I found it when going through old recipes the other day. Another plus is that you probably already have most of the ingredients on hand. It’d be a great postpartum meal for a friend home with a new baby, or for anyone on a chilly night. Enjoy! 1 package vegetarian “chicken” pieces for cooking (like Beyond Meat, Tofurkey, Quorn, or Gardein). Tofu (drained, pressed, cubed) would work well, too. Add “chicken” to pan; sauté 3 minutes. Add onion and jalapeño; sauté 3 minutes. Add ginger, garam masala, cumin, salt, and garlic; sauté 30 seconds. Add tomato, rice, raisins, and broth; bring to a boil. Cover, reduce heat, and simmer 15 minutes or until rice is tender. I’d been meaning to make this for a while. We have a neighbor who’s been unwell and once upon a time he told me how much he loved cardamom. I love cardamom, too, so when I finally got around to making this, I made a double batch. I took the leftovers to the office, and it was a hit! So, for my colleagues and everyone else, here is the recipe. Enjoy! Preheat the oven to 350ºF. Grease a 9-inch square baking dish/cake pan. For cake, combine the milk, oil, and vinegar in a bowl and set aside. In a large bowl, mix together the flour, sugar, baking powder, baking soda, cardamom, ginger, and salt. Add the milk mixture and stir until just combined. Pour into the baking dish. 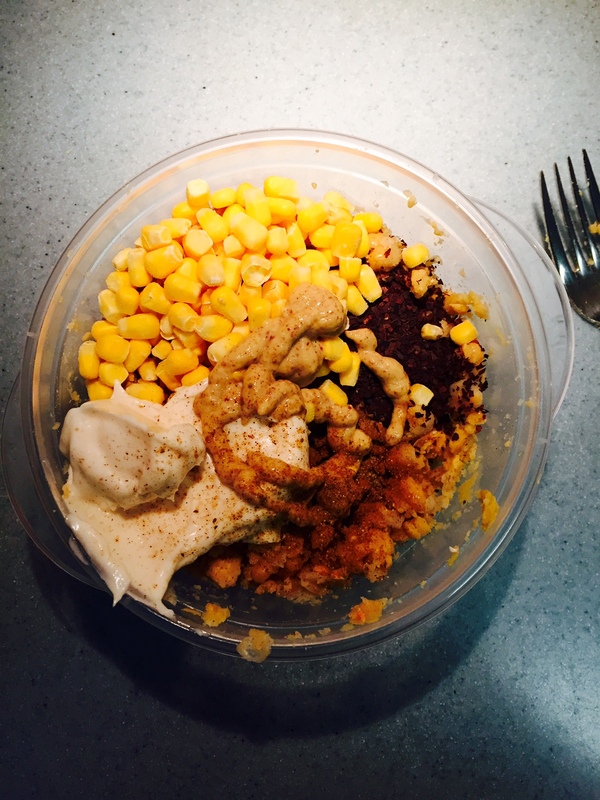 To make the crumble, in a small bowl, combine the flour, sugar, cardamom, ginger, salt, and nuts. Add the butter or oil, and use your hands to thoroughly combine it with the dry ingredients. Spoon it on top of the batter in the cake pan, covering the entire area. Bake for 35-40 minutes, or until a toothpick inserted into the middle comes out clean. Let cool slightly, serve warm or at room temperature. For a stronger cardamom flavor, I grind up cardamom seeds in a coffee grinder right before adding to the recipe. I was tempted to add a drop of cardamom essential oil, but wasn’t sure if it would be too much. Let me know if you try! The original recipe is for a cinnamon coffee cake, so just replace the cardamom with cinnamon if that’s your preference. The Joy of Vegan Baking was just put out in a new edition for its 10th anniversary! Everything in it is delicious. There was a short-lived restaurant in Manhattan called Burgers & Cupcakes. It sounded genius to me, but guess it didn’t work out. Maybe they should’ve gone for muffins. Last weekend, I had a rare burst of cooking energy. The burgers are an old favorite— I make a big double batch and freeze the patties so we have quick homemade veggie burgers at the ready. One big beet was plenty for a double batch. I pretty much follow the recipe except I had cashew butter instead of almond butter. For the beet-haters, I don’t find them too beet-y, so you may be ok. I took Isa’s advice and cooked them before cooling/freezing and that’s been much better. Another tip for busy folks— I cook the rice and lentils ahead of time, and then putting it all together is a snap on another day. This time day one was cooking rice and lentils, day 2 was shredding beets and assembling mixture, and day 3 (which was actually day 5 or something) was frying ’em up, cooling, freezing. Drawn out, but that’s the only way I get anything done anymore. Here’s the recipe for Isa Chandra’s beet burgers, and here’s a video of her making some, too! The recipe is also found in Isa Does It, which I highly recommend. The muffins were new for us, but Jonah especially was an instant addict and I’ve already made a second batch. I followed the recipe almost exactly, but I reduced the oil and sugar from the original and it worked out great. I like to use the mini-muffin tins since it feels like you get so much more and it’s easy to grab one as a little snack. Preheat oven to 350°F. Lightly grease muffin tins. In medium size bowl, mix the flour, baking soda, and salt. In a large bowl, mash up the bananas. Beat in the sugar and oil. Stir in the water and vanilla and mix thoroughly. Mix in the flour mixture. Stir in chocolate chips, and nuts if using. Fill muffin tins about 2/3 full (or evenly between them) with the batter. Bake for 20-30 minutes, until they are golden brown and a toothpick inserted into the center comes out clean. Yields 12 muffins, or 24 mini-muffins, or one 9″ cake or bread. I cannot make or eat cookies without this song in my brain. Thanks, Sesame Street! The boys wanted to make holiday cookies over the winter break, but we made these instead. We’d never made peanut butter cookies before. Jonah loves them, Leo does not. Clearly, there is something wrong with him. Oh, well. I tried. At least the cookies turned out perfect. I should know, I’ve eaten most of them. Adapted from the recipe in The Joy of Vegan Baking by Colleen Patrick-Goudreau. Line 3 cookie sheets with parchment paper, or use nonstick, or silpats. In a small bowl, combine the flour, baking soda, and salt. Set aside. Whip the egg replacer and water together (by hand in a new bowl, or with blender or food processor) until thick and creamy. In a large bowl, combine the brown sugar, peanut butter, milk, and vanilla. Beat with hand mixer until well blended. Add the egg replacer mixture and beat until just blended. Add the flour mixture and blend in. Finally, mix in the chips/nuts, if using. Use your hands to gently roll chunks of batter into pieces about golf-ball sized and place on cookie sheet. Bake for 10 – 12 minutes until set and just beginning to brown. Do not overbake! Remove from oven, let cool on sheet for a few minutes before cooling further on wire rack. Try not to eat all at once, although who can blame you, really. With a rare day off from doula work in New York City, I was running errands when I spied a package of shredded cabbage and had a sudden craving for coleslaw. Not at all seasonal (no pumpkin spice?! ), to be sure, but since my cravings are usually for sugary treats, I decided to roll with it. I bought a package of the shredded veg (green cabbage, red cabbage, and carrots), and did an internet search for coleslaw dressing when I got home. Five minutes later, I was satisfying my craving. In a large bowl, combine the mayo, sugar, lemon juice, vinegar, salt, and pepper. Whisk until combined. Add the shredded cabbage, and spinach and almonds if desired. Toss. Taste and add more salt and pepper if needed. Well, this is a pretty anticlimactic return to the ole blog, but for whatever reason, it inspired me. Lucky you. As I moved toward veganism, I knew that tuna salad was one thing I’d miss terribly. So I was thrilled to find easy peasy vegan options. This one is simplified down to the things I like best. While living in the UK for 3 years, I got into the idea of sweet corn instead of celery in the salad and still love it this way. There are a bajillion vegan “tuna” salad recipes out there, and I’ve tried several. Here’s what I’ve settled on at the moment as my favorite, inspired by the “better-than-tuna salad” recipe in Colleen Patrick-Goudreau‘s The Vegan Table. Amounts are just a suggestion, as this is all very tweakable. I’ll also mention that my very skeptical husband liked it enough to ask for seconds. Give it a shot. Mash up chickpeas with a fork. Throw in everything else. Stir. Chill for a bit. Try not to eat the whole thing in one sitting but I won’t judge. I’m eating some right now with baby carrots! This was a very easy, tasty recipe I made tonight and thought I’d share. My husband wasn’t crazy about it, but what does he know? Thank you to my friend Ava who shared the recipe for the sauce. I threw the rest together with what I had handy. While it came together quickly, there are still a buttload of dishes/pots in the kitchen waiting for a fairy to come do them. Don’t be shy, dish fairy! 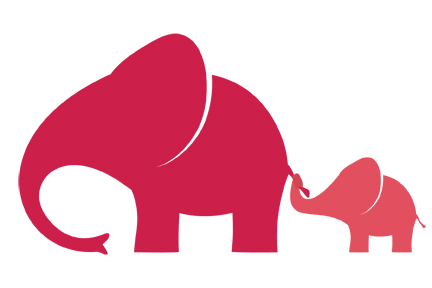 inspired by Gilt Taste <– click here and read! Put on a big pot of water and bring to boil, cook noodles according to package directions. While you’re waiting for the boil, press the water out of the tofu. I basically do it like this, except I put some paper towels on top and under the tofu and use various canned goods as the weight. Leave it weighed down for now. Preheat your oven or convection oven to 400F or so. Read ginger scallion sauce recipe through. Make sure you get out all of the necessary equipment and ingredients. Now, liberate your tofu from the oppression of the weight, cut into cubes or whatever you like, and put in single layer on foil on some sort of shallow baking pan with sides. Drizzle with soy sauce/tamari and sesame oil. Pop into the oven or convection oven for 10 – 20 mins (basically, I just let it bake until I was ready to plate the dish, but keep an eye on it). Prep the scallions and ginger according to recipe, put in big pot/bowl (I used my big stock pot) and salt to taste. He wasn’t kidding, it does taste nasty at this point. Heat up the peas in the microwave or on the stove top in a little water. Heat up the oil for the sauce according to recipe. Keep a close eye on it. When it seems damn hot and/or almost smoking, dump it in the huge pot with the scallion/ginger/salt mixture. 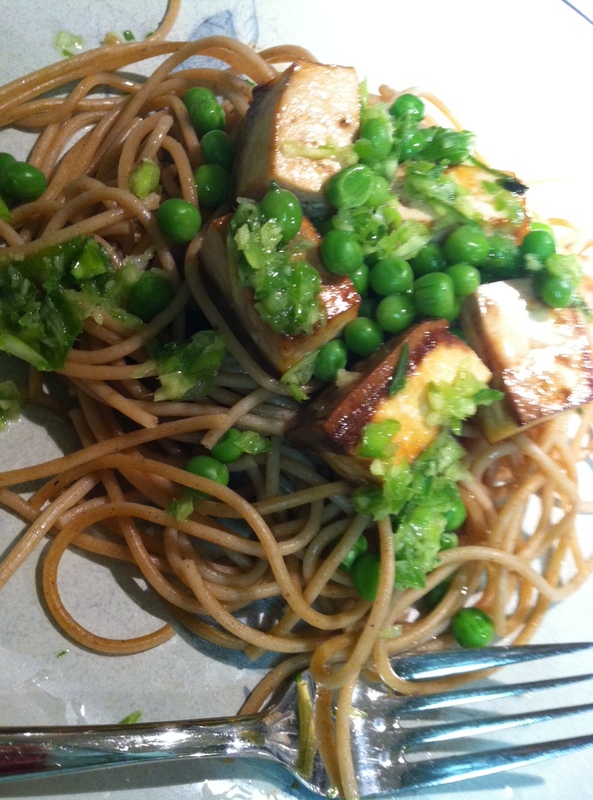 Assemble the dish: serving of noodles, top with tofu, then peas, then sauce. I used about 2 tablespoons of sauce per serving and this was probably too much as it was a bit greasy. Top with hot sauce or red pepper flakes, if desired. Gobble up. Now you know I’m no food stylist. Busted. Once I heard about “lactation cookies,” I knew that I wanted to try some next time I was lactating. No need to twist my arm on anything involving cookies. Sure, I’m a fan of evidence and all, but I’m willing to take the risk to try some of these babies to help inform my lactating sisters. I also thought that if I really like them and get my act together, perhaps this could be a future postpartum gift when I’m bringing food to new moms or debriefing with doula clients. These cookies are adapted from this site. Click on over there to read more about what makes them lactastic. I wanted to make them vegan, but if you don’t, you can add in the original 2 eggs and butter for the oil. I was also a dumbass and added white chocolate chips (white! like milk!) which of course are not vegan. You can add any combo of nuts and/or chips that you like, or raisins, cranberries, whatever. Go crazy. These cookies can handle it, and a nursing mama deserves to have her cravings met! I also think you could do any combo of sugars, agave, maple syrup, etc for the sweetener. I thought the molasses would add some interesting flavor and the extra iron would be nice for new mamas, too. 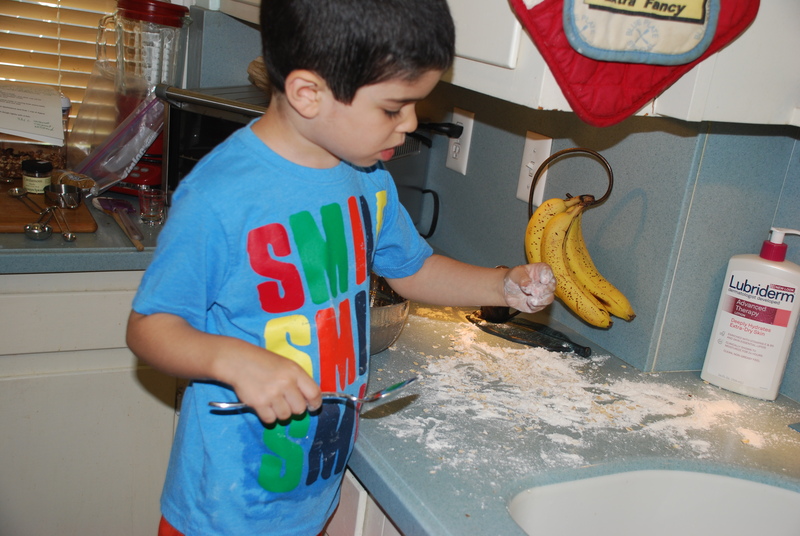 My “assistant.” He thought we were just making cookies, ha ha ha! I added cardamom because I love it, and grinding the seeds fresh really brings out the flavor. I had fenugreek in the cupboard, too, and knew it was another traditional milk supply enhancing supplement, although the amount here per cookie is likely negligible but why not go for some placebo effect. I put the cardamom and fenugreek seeds in my little coffee grinder and pulsed away until it was fine, and added the mixture to the dry ingredients. If you aren’t a fan of stronger flavors in your cookies, you can just nix the molasses (but replace with sugar/other) and cardamom and still have a lovely treat. The verdict? Very yummy cookies! Still great a day later. They are moist, chewy and spicey. Not too sweet, in fact you could probably reduce the sugar a bit further and they’d still be lovely. When I make them again, I’ll probably use about 1/2 cup fewer chips as the batter couldn’t hold them all. I also, only sometimes, get a slight bitter aftertaste. Is it the fenugreek? Let me know if you know. Oh, and do they increase milk supply? Who knows? I did have a good pumping session before bed, so what the hell, let’s say it was the cookies. 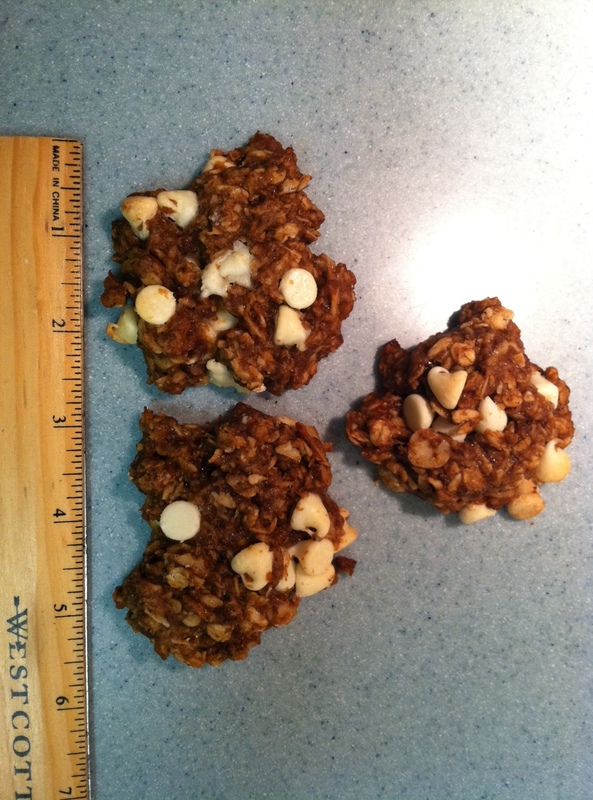 Yay, lactation cookies! In one bowl, mix flaxseed and water. Set aside. In a medium bowl, mix the applesauce, oil, molasses, sugars, and vanilla with a hand-mixer until well blended. 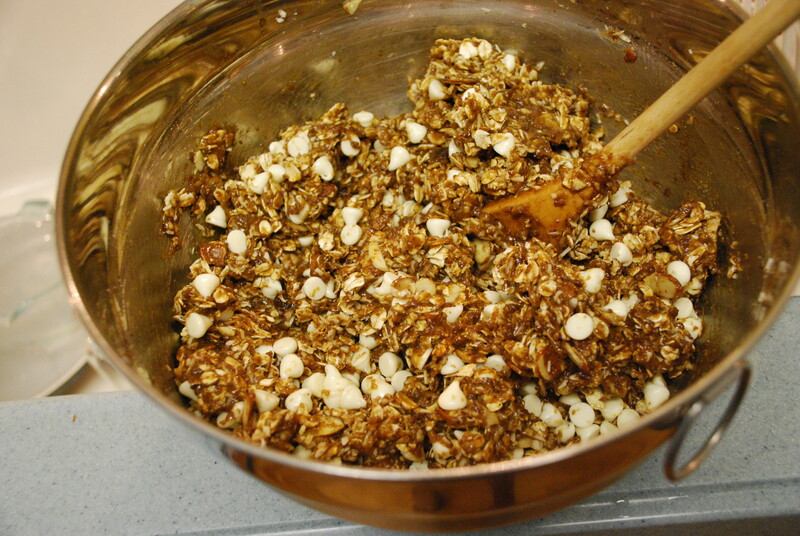 In a separate large bowl, like the biggest one you have, mix all of the dry ingredients except for the oats. Add the wet to the dry and mix well by hand. Add the flax mixture and stir some more. Add the oats and stir stir stir. Add the choc chips, nuts, coconut, or whatever additional mix ins you like, and stir until everything seems well distributed. Spoon or scoop onto cookie sheet, about golf ball sized portions. Press gently with fork. Bake about 12 – 14 minutes. Cool. Enjoy.